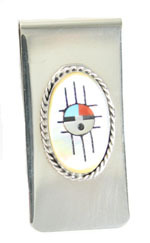 Base metal money clip with sun face style inlay design. It is inlaid with gold lip or mother of pearl shell, and sun face of turquoise, coral, black jet and shell. It is surrounded by sterling silver plain bezel and twist wire. Money clip measures 3/4" wide x 2 1/8" wide. Zuni crafted by Jeremy Hustito. ** Now only available in white mother of pearl, no yellow shell at this time.